February 17, 2015 – GPS is the world’s largest military satellite constellation and is operated by the 2nd and 19th Space Operations Squadrons at Schriever Air Force Base, Colorado. With more than 3 billion users worldwide, it is the only global utility. As Team Schriever celebrates GPS Week, they’re remembering the founding fathers of GPS — Dr. Bradford Parkinson, Dr. Ivan Getting and Roger Easton. Dr. Bradford Parkinson earned his Bachelor of Science in General Engineering at the U.S. Naval Academy and a Master of Science in Aeronautics and Astronautics at Massachusetts Institute of Technology. He earned his doctorate in Aeronautics and Astronautics from Stanford University. He served as the head of the Department of Astronautics and Computer Science at U.S. Air Force Academy. He served in the Air Force from 1957 until 1978, retiring at the rank of colonel. He has more than 150 combat hours in Southeast Asia. His military awards include the Bronze Star, Legion of Merit, Meritorious Service Medal, Air Medals and the Presidential Unit Citation. Parkinson directed the effort to define a new satellite-based navigation system, which became GPS. He helped design the system, which the Department of Defense approved in 1973. He then formed and ran the NavStar GPS Joint Program Office. The Joint Program Office developed the GPS satellites, ground systems, user equipment and an extensive test program, which validated the performance of the new worldwide system. Parkinson is the recipient of the American Philosophical Society’s Magellanic Premium and the Draper Prize. In 2004, he was inducted in the National Inventors Hall of Fame. In 2008, he was selected as an Air Force Space Command Space and Missile Pioneer. Dr. Ivan Getting received his bachelor of science degree from the Massachusetts Institute of Technology in 1933. He was a Graduate Rhodes Scholar at Oxford University and earned a Ph.D. in Astrophysics in 1935. During World War II, he was a special consultant to Secretary of War Henry Stimson on the Army’s use of radar, a relatively recent technology. In 1951, Getting became the vice president for engineering and research at the Raytheon Corporation. Raytheon suggested the first three-dimensional time difference-of-arrival position-finding system in response to an Air Force requirement for a guidance system for rail-mobile intercontinental ballistic missiles. This proposed technique was among the most advanced forms of navigation technology in the world and a crucial stepping stone in the development of the GPS. Under Getting’s direction, aerospace engineers and scientists studied the use of satellites as the basis for navigation systems for vehicles moving rapidly through three dimensions, ultimately developing the concept essential to GPS. Getting received the President’s Medal of Merit, the Naval Ordnance Development Award, the Kitty Hawk Award, and the Institute of Electrical and Electronic Engineers Pioneer Award and Founders Medal. In 1997, he received the Department of Defense Medal for Distinguished Public Service and the following year the John Fritz Medal, one of the nation’s highest engineering awards. He was named an Air Force Space Command Space and Missile Pioneer in 1998. Getting died in October 2003. Roger Easton Sr. graduated with a bachelor’s degree in physics from Vermont’s Middlebury College. He went to the Naval Research Laboratory in Washington, D.C., in 1943 to work in the Radio Division on radar beacons and blind-landing systems for aircraft. From 1944-1945, he continued working at NRL as a Navy officer. In 1952, he obtained an assignment in the laboratory’s Rocket-Sonde Branch, which was becoming heavily involved in space-related research. Easton collaborated in 1955 to write the NRL Project Vanguard proposal for a U.S. scientific satellite as part of the International Geophysical Year. In 1964, his team developed TIMATION satellites. In the 1970s, this effort evolved into a pair of Navigation Technology Satellites that tested atomic clocks for the first time in space. 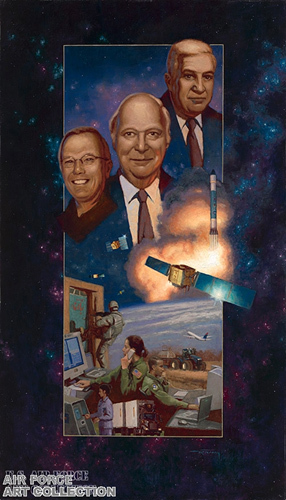 When the Joint Program Office for GPS was established, the results of the TIMATION and NTS satellite experiments contributed to development of the world’s first space-based system for highly accurate, three-dimensional positioning, navigation and timing worldwide. Easton received eleven honors from the U.S. Patent Office and many other accolades. He earned the Magellanic Premium for Navigation in 1997. On February 13, 2006, President George W. Bush presented Easton with the National Medal of Technology. He was named an Air Force Space Command Space and Missile Pioneer in 2008. Easton died in May 2014.